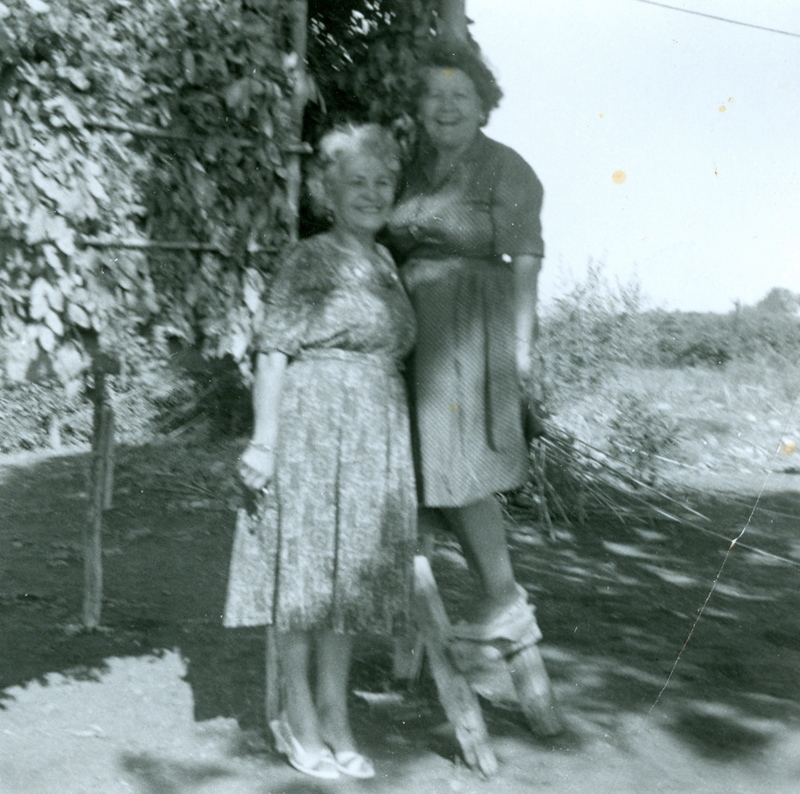 This snapshot is of my maternal grandmother, Esmine, standing next to her cousin, Aphrodite, who is artistically perched on the lower rung of a rickety stepladder. The stepladder evokes the memory of a phone call that we received in Mexico City. My parents and I had driven down from Los Angeles (in the BRAND NEW BUICK) just a few days earlier, and were ensconced in a hotel apartment pending the readiness of our new digs, which turned out to be a fabulous house in the Zona Rosa, directly across the street from the Mexican Social Security offices. A heavy iron door, when dead bolted shut, completely muted the traffic sounds and smells from the busy street directly outside the three-story home. In the entry courtyard, just below the dining room, was an indoor green-tiled swimming pool, which my mother filled with floating candles and surrounded with potted poinsettias to create “atmosphere” for the innumerable parties held there. But…that house was still in our future, and we were in the hotel surrounded by our unpacked suitcases when the phone rang. The news was that my 72-year old grandmother, never a stranger to hard work, but cheerful enough not to become a martyr to it, had climbed a tall ladder to the roof of her house in Los Angeles, to pick ripe apricots from the tree. I’d always likened my sturdy old Greek grandma to a mountain goat, so I wasn’t a bit surprised that she had done this foolhardy thing; and I’d blithely consumed many apricots at her table, oblivious to the fact that she’d risked life and limb to provide them. The unfortunate part of this most recent antic was that Yiayia’s little goat legs had failed her and she’d sailed off the roof to the concrete patio below, breaking a few ribs and puncturing a lung. Bad enough, but at least she didn’t land on her head and she lived to tell the scary story to her great-grandchildren. My shocked and annoyed mother, tired from the road trip, turned around and flew back to Los Angeles to sit by her old ma’s side during her recuperation. In the interim, my father and I went to the Mexican carniceria, bought a baby goat, roasted it in the oven in our hotel apartment and lived on it for about a week.